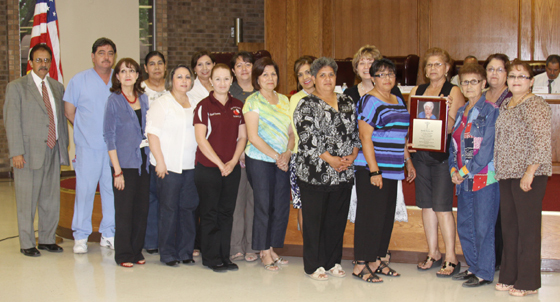 The Texas School Nurses Organization from Region One presented a memorial plaque to the family of Maria Imelda Ramon in her honor. The Plaque states "In memory of Maria Imelda Ramon for her leadership, professionalism and eagerness to serve and was a living example to others. Her devotion and dedication will be missed by all". Ms. Ramon began her nursing career in 1964 and joined the Air Force in 1968 and was deployed overseas to the Vietnam War. There she helped to care for many injured soldiers. She returned to Rio Grande City and became the Health Services Director. She dedicated the rest of her life to school nursing. Ms. Ramon's passion was helping children and their families in promoting better health.